Make your magazine daydreams come true! Have you ever fallen in love with a room from the glossy pages of a magazine or glowing screen but thought, “that looks nothing like my house”? The ceilings are high, the architecture impressive, nothing like your four walls? Recreating the vibe of the published room in your own house can often seem like an impossibility . . . . But, it’s not! And we wanted to show you how to overcome that very issue in this article. Check out these before and afters! We completely spazzzz for them! In the original ‘Opposites Attract’, we combined two polarizing tastes: traditional vs. modern. Now, in ‘Opposites Attract Everywhere’, we took that same aesthetic using the same pieces and placed them in a room that can be found in just about anyone’s house: a builder-grade space with low ceilings and zero architectural details. While it may not sound like a fancy room, we were able to give it the same elegance– and all because we originally picked pieces that were versatile for any four walls! WowieZowie, do we ever love this version of the space! And all week, we’ll be going in depth about how to recreate the look, aannnnddd, we’ll be giving away a few things from the room to get you started in your own house! Free stuff is our favorite thing! Just as interesting as the items in the original room, here is a peek at some of what we used in this space. We have carefully curated everything from flowers to paint. A comprehensive list of every item from this room can be found in the buying guide. Our biggest wish is that you get to experience the thrill of designing gorgeous rooms without the worry of design missteps. We all want a pretty house that reflects who we are and how we love to live – now it’s so easy. The floor plan in your house will likely be different from the one pictured here. That’s not a problem! You can reconfigure everything from Opposites Attract II in your own space. Our Design Guide and Buying Guide outline how to easily recreate this room in your own home. At last you can stop making costly design mistakes! 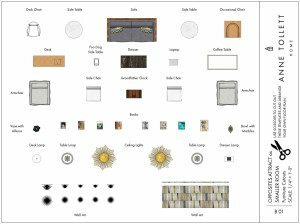 Below is a rendering just for you, a scaled printable floor plan with elevations, and a buying guide of where you can buy every item in this room. We always include complimentary 1/2″ scaled cutouts in our Design Guides for free, but if you would rather have 1/4″ scaled cutouts, here they are! Sooooo, go find your SweetiePie and make your styles work together!